The winter will pass, and surely Spring WILL come to central Minnesota. There is some melting happening in the garden already. 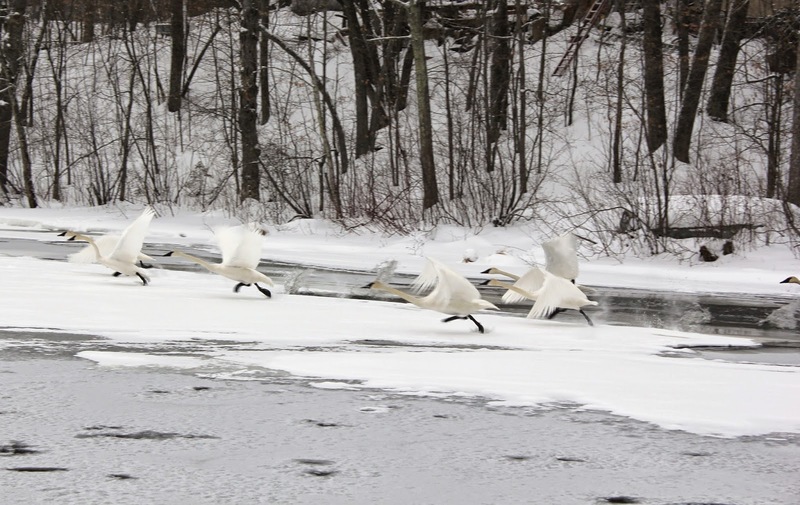 And, the swans are back and enjoying some open water. As this winter slowly leaves us, I eagerly wait for the arrival of Spring. A few nights ago I fell asleep to the sound of thunder, but awoke to four new inches of snowfall. I don't recall a winter that has tried our patience more. So many days in a row of frigid temperatures with lots of snow & ice that created treacherous driving conditions has all made for a very l-o-n-g winter. I'm looking forward to Spring and working with fresh herbal scents helps to bring it all that much closer. Just cut bars of Lilac Explosion Soaps, they will need to cure and wait for Spring too. If you visited on this soapmaking day, you might think that I had carried armfulls of lilac branches into our home. This specialty bar, Lilac Explosion is a limited edition and offered just in the spring and early summer until it's sold out. Here I'm holding a log of our Irish Heather Herbal Soap. I'm cutting the newly made soap into logs and then into bars. Irish Heather is one of my all-time favorites and we offer this soap year round. The scent is such a beautiful fresh green and reminds me of what walking into a florist shop smells like. And Spring smiled forth in May." I have always loved the saying "April showers bring May flowers", perhaps because April is my birth month. But also because the natural cycle of renewal in nature is a sweet reminder that even unpleasant things, like heavy snow and April rain, all help bring about very beautiful things - an abundance of fragrant flowers in May. May's birth flower is the Lily of the Valley which means, in the language of flowers, humility, sweetness and hope. .
"April showers bring May flowers" is also a lesson in patience. Many of life's greatest things come to those who wait, and by patiently and happily enduring the snow and clouds of April we can more richly enjoy the sights and smells of May. After this past winter, I am eager to embrace the thunderstorms of April, and patiently await the unfolding blooms of May!